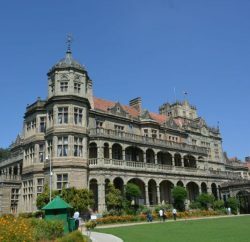 Shimla is not confined to the Mall Road only, there are many nearby places to cherish. Natural beauty is at its best in Kufri, Fagu, Mashobra and Naldehra and a day long visit to these places won’t be enough to enjoy the environment and aura of these spots. In this list we have featured few good hotels, which will help visitors to identified some without hustle. Kufri is one of most beautiful place in Shimla. It is about 16 kms. from Shimla and is known for trekking and hiking trails. It has some beautiful nature parks and picnic spots. It is famous for winter sports. This place is also full of lush green hills. In Kufri there are few good hotels that can make tourists visit refreshing and memorable. Enjoy beautiful views of mountains and valleys from the restaurants, outdoor Jacuzzi and the heated swimming pool. Take leisurely walks on the trails winding through the fragrant pine forests and enjoy Gourmet picnic hampers that accompany your explorations. For the adventurous the resort offers white river rafting, trekking, mountain biking, archery, billiards, ice skating (in winter) and golf. Kufri Holiday Resort is designed for your senses. Spectacular Views, Peace and Quiet, Serenity Tranquility greet visitors. This quiet Resort, nestled in the natural beauty of the Himalayas and designed in the local Himachali vernacular architectural style is spread over acres of mountainside, with a backdrop of forests, snow-capped mountains and beautiful scenery. Kufri Holiday Resort offers cottages, luxury suites and rooms for every taste and budget, all with spectacular views and amenities. Himachal Pradesh Tourism Development Corporation has hotel near Kufri, Apple Blossom Fagu, it is about 25km from Shimla City and is lies on Indo-Tibet road. The hotel has been rebuilt and converted into a modern and commodious Deluxe Hotel. It provides a rare opportunity to enjoy nature’s serenity and magnificence. The hotel presents a rare and kaleidoscopic view of the landscapes dipped in mysterious mist all around. The suites at the hotel offer a great view of Sun Rise as well as the Sun Set. Hotel Woodpark is situated at Kufri located at a picturesque 45-minute drive through forested hills from Shimla. The resort is a serene and relaxed getaway offering an experience of nature. It also provides an ideal base for exploring the Himalayan region. Naldehra-Mashobra is another place to visit. Located at distance of 22 km from Shimla, Naldehra (2044 m) is a heaven for tourists. It boasts of the oldest 9 hole golf course in the country. The well groomed Golf Course is a lovely verdant, perhaps one of the finest and sporty in India. Crowned with a springing turf the Golf Course was suggested by Lord Curzon. He was so enchanted by the place that he gave his daughter Alexendra, “Naldehra” as her second name. It is the venue of many competitions. The Nag temple is also situated here and Naldehra derives its name from it. Hotels near Naldehra. Heritage Chalets Naldehra extends from a thickly forested mountain spur and has the view of a deep valley. This is a place for leisure, recreation, family and corporate bonding, adventure, golf and is an appropriate venue for conferences. This is not just a place where the ‘room has a view’, but where every window has a different view. The chalets have been built with technology and wood imported from Finland. These fir logs have been specially treated in a high-tech plant and been given a finish that is both enduring and warm and welcoming. This combination of the best of what the world has to offer in lodges for the mountains, and an absolutely magnificent setting in the Himalaya – arguably the greatest mountain range on earth – makes Heritage Chalets Naldehra as one of the world’s true mountain retreats. Marigold Holiday Resort is situated at about 15 km from Shimla at Mashobra-Naldehra. Marigold is a set of apartment / self-catering cottages overlooking the valley and away from the crowded Shimla. Marigold is unique as it as a self-catering option for long-stay guests. These Himalayan Stone Cottages in Shimla are double-walled, with local stone comprising the exterior; innovatively structured to keep you breezy in the summers, and glowing in the winters. The first / base unit of these Mashobra hotels comprises of an airy trendy studio apartment which merges into a bedroom, a living room and a kitchenette. Above the studio apartment of the resorts in Mashobra lies the duplex cottage. The top consists of two elegant bedrooms, with bountiful balconies and a charming view of the lawns and greens around. The stairway will lead you into the heart of the cottage – the living room, with an added kitchenette to bring out the chef in you. Koti Resort a luxury retreat located on a hill with the most spectacular view of the Himalayan ranges & deep valley, the Resort consist of 54 rooms all fitted with a double bed and other modern amenities designed like a Swiss Chalet in perfect harmony with its natural surroundings provides a welcome sense of privacy and serenity of picturesque Himalayas, wind caressed deodar forests & apple orchards making it the ideal retreat for a Family holiday, A Romantic Honeymoon, or a Corporate sojourn. Koti Resorts offers indoor solar heated swimming pool. Table tennis, snookers & video play stations. Swings & slides for little children as well. Kufri is one of the most beautiful places in Shimla, I disagree. It is one of the dirtiest places around Shimla. Moreover the government is hell bent to ruin this place as a popular tourist place. See the road conditions for the last 4-5 years!